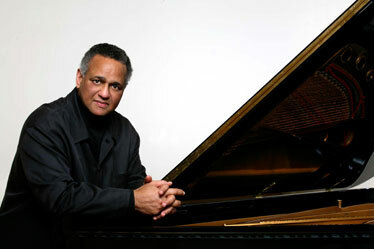 Pianist Andre Watts joins the Honolulu Symphony Orchestra on Saturday and Sunday at the Blaisdell Concert Hall. Evolve or adapt? Nature or nourish? Training or talent? Adaptive physiology doesn't often come up in music, but when it comes to your hands, it's best to cover all bases. "My hands were small when I was a boy," says pianist Andre Watts, performing this weekend with the Honolulu Symphony Orchestra. "I could still cover a full octave, though, because I started young enough so that my hands could be trained. They seemed to get larger." Which is why great pianists start early in life, it seems. All those keyboard exercises nudge the musculature and tendons of the hands into a shape that dances easily on the ivories. "Concert pianists start early -- 15, 16, 17 years old -- and the flexibility is a big advantage," says Watts. "I tend to play from the neck and shoulders, so that's where I feel it later. My hands are fine. Well, I'm 62 now, so nothing's as flexible as it used to be!" That means a career at the half-century mark. Unlike many child prodigies, Watts has continued a remarkable musical career into the AARP age. "I certainly can't run the way I did at 10, but I can play the piano better!" Watts laughs. An Army brat who bounced around European duty posts, Watts was raised by his NCO father and Hungarian mother to respect music as an integral part of a rounded education, although they wanted him to become a surgeon. After dabbling with the violin, Watts gravitated to the family piano. "I was quick at it, and when we moved to Philadelphia when I was around 8, my mother had me study with teachers other than herself." The finger-stretching paid off. Watts played with the Philadelphia orchestra when he was 10, Leonard Bernstein at 16 and won a Grammy for best new classical artist at 17. Watts was barely old enough to vote when he played President Nixon's inaugural in 1969. Those Watts hands, stretched and shaped in childhood, have served him well, making him still one of the top-rated concert pianists today. "There are parallels between musical careers and sports athleticism," Watts muses. "Movement and concentration. Body and heart. You can peak in music later, though, unlike the kids in the Olympics." What about other meme about musicians, that there's a relationship between musical ability and mathematics? "Well -- I manage to balance my checkbook."